When I tasted these dishes I instantly knew that I had laid my hands on a treasure trove. I am fortunate these almost lost recipes and will share the same with you in my subsequent posts in the 10 post series on the Bygone Era Indian Cuisine. Dear readers no matter in which part of the world you are you can cook these dishes and traverse through bits of Indian History through it's exceptional cuisine. So let's get the ball rolling with a Regal looking, colourful vegetarian dish called Angoori Kofte. Angoori Kofte is a unique mix of vegetabkes, herbs, milk products, exotic spices etc. 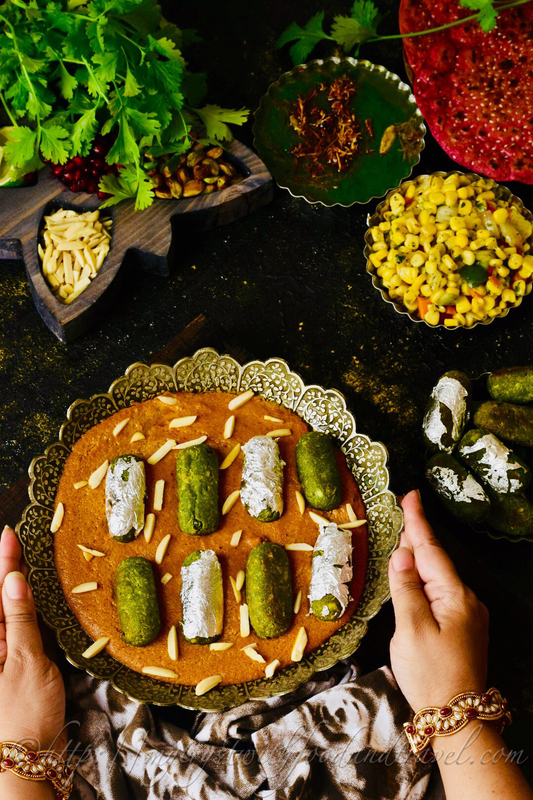 which are combined and shaped like a grape or Kofta which is served on a bed of a Supremely creamy, rich, royal gravy. 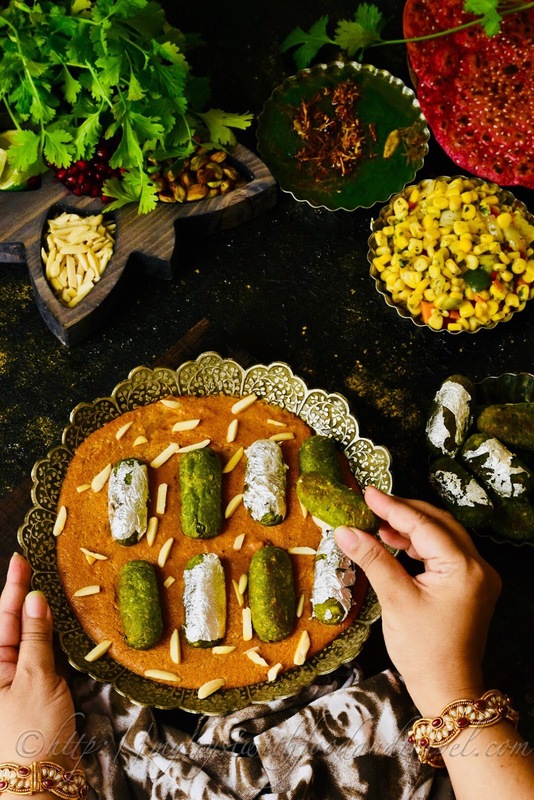 Angoori means like a grape as these Koftas are shaped almost to resemble a grape or angoor and had the similar green colour as that of grapes hence the name. The Angoori Kofte is nothing like any of the Kofta curries that you have tasted till date. If you don't believe me then please try this recipe and you will be happy that I told you about this dish. I have followed the original recipe without making any change. The only change I made was to replace the poppy seeds paste with melon seeds & cashewnut paste as poppy seeds are banned here. 1) Take a large mixing bowl. Add the first 11 ingredients that is upto Salt to taste from "For The Angoori Kofte" list of ingredients above. 2) Mix everything nicely to form a soft dough. 3) Divide the dough into equal parts. Take one piece of the dough, shape it like a ball, flatten itlike a disc and place a pistachio in it's center, just like the image below. 4) Now bring all the sides of the disc together, roll it between your palms and shape it like a cylinder or green long grape. Please note the length of these Angoori Kofte should not be more than 2 inch. 5) This is how your Angoori Kofte should look just before frying. 6) Take a wok, fill it with oil. Deep fry the Kofte in it. 7) Special care should be taken to regulate the temperature of the oil. The oil should be neither very hot nor just warm. The idea is not to change the colour of the Angoori Kofte to brown but to fry it well with a light golden brown tinge. Drain the Angoori kofte and place it on a kitchen napkin to remove any excess oil. Wrap some of the Angoori kofte in silver foil. 1) In a wok take oil. Add fenugreek seeds. Let it crackle. 2) Add boiled oinion paste. Cook for a couple of minutes. 3) Add turmeric powder, yellow chilli powder, red chilli powder, coriander powder. Mix well and cook for a couple of minutes. 4) Add tomato puree, mix and cook for a couple of minutes. 5) Add Poppy seeds paste ( I added melon seeds and cashew nut paste) followed by the almond paste, mix and cook for a few minutes. 6) Add garam masala, green cardamom powder, salt, mix and simmer till oil leaves the sides of the gravy. 7) Add little water now and simmer for a coup,e of minutes. 8) Finish off with a dollop of fresh cream. Mix and your gravy is ready. 9) Add the koftas and serve.